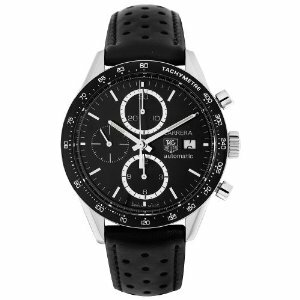 You are here: Home / Tag Heuer Watches / Carrera / Tag Heuer CV2010.FC6233 Carrera Automatic Chronograph Men’s Watch Review: A Compromise or a Success? Tag Heuer CV2010.FC6233 Carrera Automatic Chronograph Men’s Watch Review: A Compromise or a Success? The bezel of the CV2010.FC6233 has tachymeter functionality, while the dial features hour, minute and seconds, plus a chronograph. A date readout in black print against a white background reads out on the right side of the dial, providing a bit of warmth and off-setting white to the predominately black colored appearance of the watch. The case is made of a striking stainless-steel, but otherwise you will find a black dial with white touches of white in the hands of the watch and the minute marks around the main dial and smaller dials within. One element of the design of the Carrera Automatic Chronograph that may seal or unseal the deal for you is the black calfskin leather strap. Deciding not to go with more of a luxurious or classic appearance in its leather, this Carrera features a perforated calfskin strap that makes the watch look sporty, but, for some other buyers, it may tone down the class of the watch a notch. Other part decisions made for the watch may turn people away as well. At the price point the Tag Heuer comes in, you may want a more reliable time keeping than an automatic movement watch provides. The quartz movement found in many high-end watches provides a more accurate keeping of time, especially considering some reports of automatic movement gaining at least five or seven seconds a day in time. Other materials on the watch meet the higher standards a Tag Heuer name implies, as the window of the watch is a scratch resistant sapphire instead of the less reliable synthetic sapphires, and water resistance depth hits 165 meters instead of the 100 meters of others in the Carrera line. Featured Time Keeping Functions such Date, Chronograph and Tachymeter. Water Resistant to 165 meters. Automatic movement makes for less reliable time keeping than quartz movement. Perforated calfskin strap may remind you of many rubber straps. Yes, those are sweat holes. 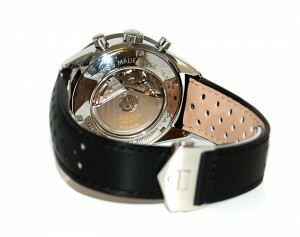 In the end, it comes down to what you feel a watch in the price range of the CV2010.FC6233 must feature. For some, the automatic movement may be a deal breaker, but for people who like their watch being a little ahead in time, it won’t matter. You may find you like the way Tag Heuer combines class with sport in their watch designs, but I advise you to check out the entirety of the Tag Heuer line then. You may value the features in time keeping that this watch provides, but you may want to consider the quality of the parts keeping time as well before making your choice.